Oh dear. 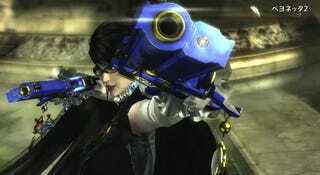 Bayonetta 2 is out in Japan, and it looks like a terrific game. The early buzz on it is super positive. Shame that not many people are buying it. Blame the Wii U for that? As My Game News Flash points out, when the first Bayonetta game was released on the Xbox 360 and the PS3, it sold around 200,000 copies in the first week. That's terrific. But Bayonetta 2? According to 4Gamer, the Wii U exclusive sold just 38,828 units in its first week on sale in Japan. That's not so terrific. Platinum Games said they were working to have Bayonetta 2 played by more gamers than the first game. That might be difficult in Japan... on the Wii U, at least. There are commenters online in Japan saying the game "bombed." A few are spamming Bayonetta's creator Hideki Kamiya, telling him "congrats." That isn't cool. At all. Maybe it's because everyone is busy buying Super Smash Bros for 3DS? Maybe! That game just sold 321,363 copies in the same week. Or maybe the reason is the Wii U. Then, it's not really Platinum Games' fault, as the game was bankrolled by Nintendo. Just be glad the sequel exists, no? But if the game doesn't do well outside Japan, a third entry in the series might not even happen. Talk about depressing. Update: Yikes, Dengeki Online's sales figures are lower than 4Gamer's. According to Dengeki, Bayonetta 2 sold 28,825 copies in its first week on sale.